More than 350 people have been confirmed dead and hundreds more are missing after the cyclone that unleashed devastating floods in Mozambique, Zimbabwe and Malawi. Aid workers rushed to rescue victims clinging to trees and crammed on rooftops amid fears that many thousands of people are at risk. In Mozambique, the rapidly rising floodwaters created "an inland ocean", endangering tens of thousands of families, aid workers said as they scrambled to rescue survivors and air-drop food, water and blankets following Cyclone Idai. The United Nations allocated $20m (€17.6m) from its emergency response fund to ramp up the humanitarian response in Mozambique, Zimbabwe and Malawi. The European Union and Britain have also pledged aid, and the US Embassy in Zimbabwe said America was "mobilising to provide support" to partners in the three affected countries. "There was a house there, it was buried and the owners may have been buried with it. They are missing," said Zacharia Chinyai, of the Zimbabwean border town of Chimanimani, who lost 12 relatives in the disaster. "We heard news on the radio" about the flooding in neighbouring Mozambique, he said. "But we never thought we could also be victims... No-one told us it was going to be this devastating." "I wasn't able to save anything except this baby," she said of her lone surviving child, a six-month-old son, who suffered an eye injury and scars to his face. "I knew she was already dead. I cried the whole night," Ms Dhliwayo said. "I lost so much that I wish I had just died." The cyclone created southern Africa's most destructive flooding in 20 years, said emergency workers. Heavy rains are expected to continue through today. Mozambique's Pungue and Buzi rivers overflowed, creating "inland oceans extending for miles and miles in all directions", said Herve Verhoosel, of the World Food Programme (WFP). "This is a major humanitarian emergency that is getting bigger by the hour," Mr Verhoosel said. He said people were "crammed on rooftops and elevated patches of land". 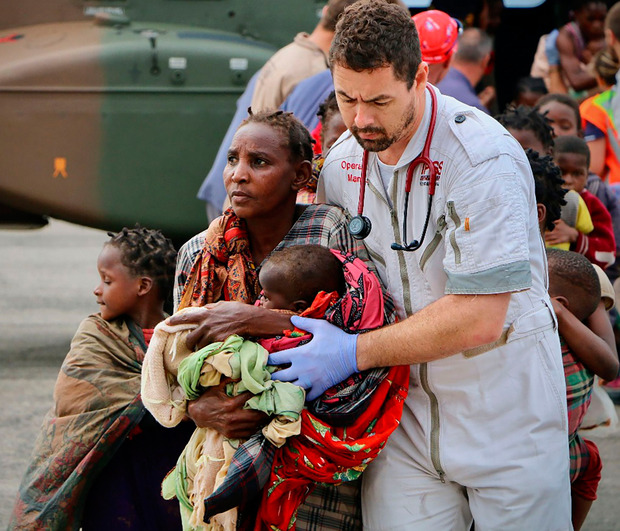 "It's dire," Caroline Haga, of the Red Cross, told the Associated Press from Beira, a city of 500,000. "We did an aerial surveillance yesterday and saw people on rooftops and in tree branches. The waters are still rising and we are desperately trying to save as many as possible." Satellite images were helping the rescue teams target the most critical areas, Ms Haga said. Rescue operations were based at Beira airport, one of the few places in the city with working communications. The waters flooded a swathe of land of almost 400sqkm in central Mozambique, according to the European Union's global observation programme, which was mapping the crisis, putting more than 100,000 people at risk. "The full horror, the full impact... is only going to emerge over coming days," Red Cross spokesman Matthew Cochrane said.